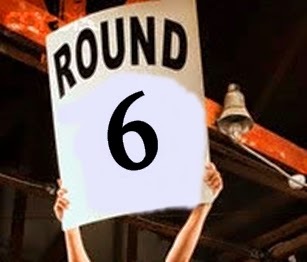 It's week #2 of the WRiTE CLUB play-off rounds – which I promised would come at a rapid fire pace -- and we have four more bouts scheduled. I must say I'm a little disappointed with the participation we've seen so far. Last year we averaged 31 votes per bout in the playoffs, and this year we are averaging 27. Yes, it is early, so the numbers could rebound, but it is also up to all of you to help make that happen. Please help out in any way you can to ensure that the work from these wonderful writers is seen by as many readers as possible. Last week I posted five bouts (Mon-Fri) and this week are the last four (Mon-Thur). The voting for all nine bouts will remain open until noon on Sunday, August 31st. Your task remains simple…read the submission from each WRiTER carefully and leave your vote for the sample that resonates with you the most. If you haven’t already done so in the previous rounds, offer some critique if you have time. Anyone reading this can vote, so blog, Tweet, Facebook, text, or smoke signal everyone you know and get them to take part in the fun. Vote on as many bouts as you can get around to. Whether that is one bout, or all nine, how much you participate is up to you. Waiting with the patience of the universe. Prayers and memories and hopes. I will offer feasts and more feasts. It matters not that I taste only ashes. But I have only the patience of a woman. I will have no more left. I will take a ship to water. Silk robes for a cloak of wool. And conceal poison in the red of my lips. Through the mist of a siren's song. Won't be difficult at all. I will be a sailor until the sea grants me passage. Calling luck to my side. Or women with wings of steel. Stories old men tell won't scare me away. I will leave my name at his doorstep. Even if her draughts taste like peaches and honey. And cry over souls lost to pleasure. And my dagger will open doors closed to women. Of Artemis, who guides my hand. So you will never have to count your blessings. I will stand with the strength of Heracles. And keep it on my banner. May you know I seek you always. Where waters fall into the abyss. Until my voice is dry and my words are echoes. And the shadow that walks next to it. Liam hadn't slept. By the light of a single candle, he sat at his desk penning a note to his apprentice regarding matters that might require attention after Liam was gone. He rolled the pen between his fingers, trying to imagine just what else Egan might need to know, a process he was finding difficult due to his uncertainty about how long he'd be gone. Sielan lore held that Zareth had returned from the mountain after a time. In all his years of studying the passages, Liam had never realized just how vague that sounded. What kind of time were they talking about? A day? A year? If you find me gone for a significant period of time, please divide the gemstones in my armoire between yourself and whomever you deem worthy. But please, do not forget Clara, who brings our breakfast each day. And Chelsea, the tailor, who has always done me special favors. I have tipped both of them handsomely for years and get the feeling they rely upon it. His heart lurched in his chest at the thought of gemstones, remembering a very key detail he could hardly believe he'd forgotten. Whatever you do, Egan, do not touch the aetherstones! Handle them with tongs and place them in a secure container. For reasons that we've spoken about, I have never told the council of their existence. He rubbed his forehead, contemplating the next part. What should be done with the stones? They'd be quite a boon to Sielu in general, but he felt dubious about the manner in which they might be used. The sound of the clock in his bedroom interrupted any further musings. Five-of-morn. Satisfied that he'd covered everything of importance that might occur in his absence, he went to his bedroom and began his morning routine. He washed and dressed, pulled his wild hair back and secured it away from his face. He tucked the note to Egan into his pocket. He smoothed the faded blanket on the bed, stepped into his old, worn boots and went to rouse his apprentice for their morning sparring session. Though he was eager to proceed with the plan he'd laid out, he had to admit that the sleepless night hadn't done him any favors. He needed the exercise today even more than usual. He needed to center himself. Besides, he thought, it wouldn't do to simply vanish without a word. I'm voting for A. Bard. It's a beautiful poem, with carefully chosen words and great feeling. I'll go with A. Bard for this one. Both are so well written, but going to have to go with Imladris. I know my voting has been sporadic. I appologize, We've been fighting some nasty illnesses over here. This is the first time this year I've struggled to choose. I wish I could vote for both. But I think I will go for Imladris. A Bard for me. It's a gorgeous poem. Worst round for me; I love them both. A. Bard for me, though. but I'm voting for a bard. Lovely poem, but I'm going to have to go with Imladris. I like both of these a lot but as I can only vote one it will be A.Bard. Best of luck to you both. A. Bard gets my vote. My vote goes to A. Bard. Cruel and unusual punishment to have to pick between these two! This is tough... both are wonderful. Going with Imladris.